December is fully upon us, and you know what that means—it’s officially the International Month of Top Ten Lists. From “Top 10 Adopted Children of the Year” to “Top 10 Photos of Stock Brokers Looking Depressed,” it’s safe to say that you can find it all somewhere on the web. But when it comes to the more practical aspects of life, we like how Lifehacker rolls, getting "meta" by providing a list (top 20!) 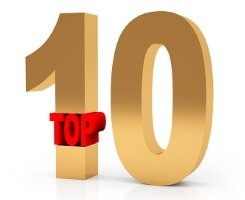 of The Most Popular Top 10’s of 2008.